I see very few survival and emergency-preparation web sites focusing on water, personal and group hygiene, and basic sanitation; yet these are fundamental to our safety, security and health if we're to survive an emergency, whether of short or long duration. Let's address some of the issues involved. First, survival itself depends on access to potable water. Municipal water supplies are taken for granted, but they can be interrupted by many problems. Drought can empty the reservoirs; pipes can fracture under the stress of heat, or earthquakes, or due to age-related deterioration; environmental activists can alter established patterns of water usage; or competing claims for water may leave some with sufficient for their needs, while others have to curb their consumption. In an emergency situation, any or all of these problems may arise, plus the added complications of local purification and pumping facilities that may not be staffed (because their personnel are looking after their families), or may not be functioning (due to lack of electricity or other problems). For all these reasons, a reserve water supply is essential. For First World residents, this doesn't have to be very large on a permanent basis, because water supplies are not likely to be interrupted without at least some warning. My rule of thumb is to have sufficient water for drinking, cooking and cleaning purposes for a minimum of three days. Drinking and cooking needs will require at least one gallon per person per day; adding personal hygiene to the mix requires another gallon. Therefore, I reckon on storing six gallons per person in a 'ready reserve' for emergency use. These can be in the form of spare containers filled with tap water, or one-gallon jugs of water from the supermarket, or even smaller bottles of water (for example, it takes 8 16oz. [500ml.] bottles to make up one [US] gallon, so two 24-pack bottles per person will be adequate for your 'ready reserve'). Rotate your reserve water supplies with reasonable frequency so they don't go stale. Purpose-made potable water barrels (like these, for example - expensive, but very useful). Rain barrels, like this one. Collapsible tanks, like these, for example, which are easier to store, and may hold much more water per container than barrels. Used barrels (which cost less, but may need cleaning, and may not be suitable for potable water - you have to check very carefully). Emergency water containers that fit in a bathtub (very useful in time of need, and cheaper than barrels, but single-use-only and non-portable when full. They also preclude using the bath for washing, of course, just as storing water in the bathtub itself would do - which is not a good idea, because it's difficult to get rid of all the soap scum and ingrained dirt). Jerrycans or other water containers of similar size. Regular 5-gallon plastic buckets can be pressed into service as water containers, if necessary. Lids are essential to prevent contamination of the water. 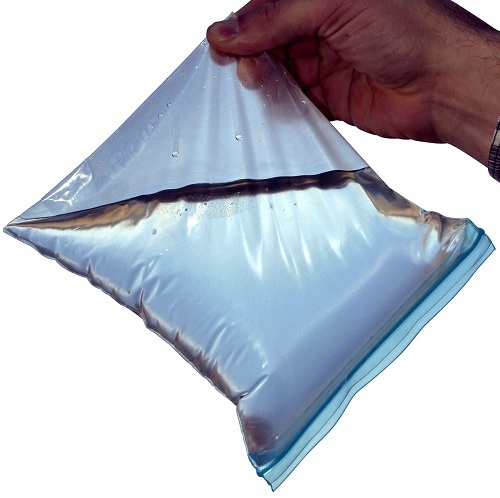 In an emergency, zip-lock bags can be used to store water. You should use better-quality bags, preferably with a double closure, because cheap flimsy bags may burst open under the weight of their contents (particularly if bags are piled on top of each other). I try to keep a couple of boxes of 1-quart and 1-gallon zip-lock bags in my emergency supplies. They're useful for so many things that I regard them as indispensable. Be warned that many water containers are not very well made. If you read the user reviews of Amazon.com's selection of water containers, many appear to be not worth the money they cost - they leak, caps prove less than watertight, spigots break, etc. That's another reason I like 2-liter soda bottles; not only are they essentially free, they're pretty strongly made to allow soda to be shipped around the country, therefore (so long as the caps are in good condition and you keep them upright) they tend to stay waterproof. It's good to have a few 3- to 5-gallon containers for portability, but apart from that, the larger 30- and 55-gallon water barrels are often a more reliable investment, albeit less easily moved when full. Make sure that your containers are safe for potable water - some aren't, due to being made from non-food-grade materials, or previously having contained substances that may be dangerous to your health. Emergency water filters are available from many suppliers, ranging from low-cost to extremely expensive. You can even build your own perfectly usable filter for relatively little cost, as discussed in a useful article at practicalsurvivor.com. Water purification tablets are also widely used, although some leave a nasty after-taste, and household bleach can also be used for this purpose (scroll down at the link to find the relevant section). Boiling water is an old and proven stand-by to kill germs and viruses, although it won't remove particle contaminants like mud. My personal choice is to have a couple of small personal filtration units for use on the move; a larger purification filter like these units, which use the standard 5-gallon bucket, for household or camp use; plus water purification tablets to take care of any risk of disease that may not be eliminated by the filters. Check the specifications on your filter(s) to be sure they can remove any diseases and/or micro-organisms you're likely to encounter in your area. If in any doubt, use water purification tablets or household bleach after filtering, so as to be doubly sure of protecting yourself against infection. Drinking water: a minimum of half a gallon per person per day, preferably a full gallon if sufficient water is available. Cooking water: a minimum of half a gallon per person per day. Washing cooking utensils: as required, keeping it to a minimum. Personal hygiene: up to one gallon per person per day. Washing essential clothing such as underwear: up to one gallon per person per day. Washing crockery and cutlery, if necessary: as required. All other uses are secondary to these. Essential uses take priority over important ones, which can be dispensed with altogether for short periods if necessary. Here are a few hints that will make water conservation easier. Teach your family to take what we used to call a 'staaldakbad' (steel helmet bath) in the military. Measure out a small amount of water into a mixing bowl or other helmet-sized container, and use that, a washcloth and soap to clean the essential bits; the face, under the arms, the hands and feet, and finally the groin and between the buttocks. Use as little soap as required for cleanliness, so that you don't need a lot of water to rinse yourself off. Long hair may be an unaffordable luxury, as it needs more frequent cleaning. In a prolonged emergency, short hair for everyone may be the order of the day - and to hell with the dictates of fashion or personal vanity! As for other personal hygiene supplies, find out what deodorants, toothpastes, etc. are preferred by those who might take refuge with you, and lay in a supply of them - or ask them to do so themselves, with the warning that if they don't, you won't! Don't bother buying fancier cosmetics. An emergency is usually a crisis, not a make-up competition! Choose a simple, low-cost bar-type soap and keep some in your emergency stash. That'll be cheaper and easier than trying to muck about with bottled soft soaps. Furthermore, if you have to evacuate, it's much easier to give everyone a compact bar of soap, rather than a plastic bottle that might leak in their emergency pack and cover their clothes with its contents! It might be worth buying a few travel soap holders and toothbrush containers for that purpose. (Also, if you or anyone else uses electric personal care appliances like razors, toothbrushes, etc., keep some old-fashioned, unpowered versions in your emergency supplies.) Finally, stock several containers of baby powder or an equivalent substance (I prefer corn starch powder - you can buy the boxed version for cooking, which is much cheaper than body powders, and use it for personal hygiene as well). This can be applied to sweaty areas, soaking up perspiration and minimizing body odor problems. Think about sanitation, too. Your toilets rely on running water to flush them. If the main water supply is cut off, your toilets will have to be flushed with buckets - but if there's no steady water supply available, you don't want to use your precious emergency reserves for that purpose. Instead, convert a 5-gallon bucket into a toilet using one of these devices, and line it with a 13-gallon kitchen garbage bag. Put a little kitty litter into the bag to soak up any detritus. Use this makeshift toilet for solid waste, not liquid (if it's only urine, use a different bucket, then dump the accumulated liquid in the garden or somewhere else convenient). As for disposing of the waste, tie the bag tightly closed after use and deposit it with others in a distant corner of your garden, or somewhere else out of the way. Bear in mind that sanitation, and garbage and waste disposal, are likely to become serious problems within a few days to a week after a major emergency occurs. After all, municipal workers won't be on the job (they'll be looking after their families) and the garbage trucks won't be running! Industrial action or other problems can also bring about a waste management crisis, as the residents of Naples, Italy learned a few years ago. Expect to have to find places to dump your own garbage, where it won't affect you with its smell or the spreading of germs. (Note - stock plenty of thick, heavy-duty garbage bags!) Also, watch out for piles of garbage collecting in your neighborhood. Small pests such as rats, mice, cockroaches, etc. will very quickly infest them, and larger pests such as possums and raccoons will follow. All of them will fan out from there to prey on nearby residences. If possible, work with your neighbors to co-ordinate a dump site that's as far from your homes as possible. However, if the problem grows unmanageable (and if you live anywhere near a sizable inner-city 'urban ghetto', it probably will), you may not have any choice but to move away from the area, for your health's sake if nothing else. There's lots to think about, isn't there? Best to do so now, before an emergency arises. I would also like to point out that one can also stack a 5 gal bucket inside another for a bit more height. In a hot area, it may be a good idea to do the SAS trick of rotating two sets of clothes- a 'wet' set for daytime use, and a 'dry' set to relax & sleep in. Hang up wichever you're not using. Aaand, bar soap also works for washing clothes and hair. Plus, one can use rinse water from bathing for washing clothes... and the rinse water from one load as the wash water for the next. Finally, one's gutters are a perfect water collector. A clean plastic 55 gal drum under a downspout can provide a lot of water for cleaning and washing. Excellent article. You always hear about water for cooking and drinking but never anything about it's use for personal hygiene. Part of our hurricane prep is to remove the bags and contents from the garbage, yard waste, and recycling bins (3 total). The bags will do just fine if in a protected area. We then re-bag the containers and fill them with water. That water can be used to flush or wash as-is and for drinking and cooking with minor treatment. Regarding garden hoses, I guess you have to know your hose. I've been drinking from them since I was a kid -- still do when I cut the grass. On the other hand, maybe that explains a few things. I've lived in a few homes abroad where the mains water fed the kitchen cold tap directly, but all other uses were fed from an attic tank fed from the mains via a float valve. I've no love for gravity-fed showers, but it did have the side effect that I had no fear of a supply disruption. My current house has an interesting plumbing system after years of DIY kitchen and bathroom rearrangements by previous owners. I'm pondering ripping it out and starting fresh, and using an attic tank for portions of the system, so that I still get good showers but I also have a constantly rotating supply of stored water. I have considered various water storage options. A relatively simple and inexpensive option would be to incorporate an additional 40 - 60 gallon water heater into your home. Of course you don't need to ever hook up power or turn it on. Just have it somewhere in line with your other plumbing. A good option is to put it outside at a back yard hose outlet, or in-line with a low-use item; this way if there were to be a toxin in the public water supply, it would not be readily cycled into your emergency supply. You would, however, need to go out to the "well" for water during the emergency period.